You can visit the Willard House and Clock Museum site for details and directions. Gary interviewed by syndicated columnist in a series estate antiques. Gary has been interviewed by syndicated columnist Marni Jameson for an ongoing series on evaluating and managing Estate antiques. Marni has connected with Gary via his appraisal work on the PBS series Antiques Roadshow. Follow each installment here on our blog, by clicking here. Marni Jameson is a nationally syndicated home design columnist, and author of the best-selling The House Always Wins. Marni’s hugely popular syndicated column, “At Home With Marni Jameson,” appears in more than 30 newspapers throughout the United States and Canada reaching 7 million readers each week. Marni's column offers advice and guidance filtered through her personal experiences. Gary's antiques crossword puzzle published in Maine Antique Digest. Here is what appears in the September 2012 Maine Antique Digest. Everyday life in the 18th and 19th century included the use of many utensils and implements which are now obsolete. Common objects that were necessities of life, particularly in the kitchen, are today almost completely unknown to all but the most serious historian. Had you lived in that era, you may have regularly performed such tasks as filling your trencher from the firkin, winding the jack, or rolling a jagging wheel. You might have used the piggin to fill your noggin, or even your swigler. As amusing as these terms seem today, they were no joke to our forefathers. So as you go about your daily routine, just be glad that you don’t have to adjust the trammel so you can clean the keeler. Gary Sullivan has created this crossword puzzle of obsolete kitchen related implements (with some related words thrown in). Test your knowledge of these obscure historical objects. Good luck. You’ll need it!! The winner receives absolutely nothing…except the admiration of fellow historians, or perhaps a noggin of grog. SEND US AN EMAIL IF YOU NEED THE SOLUTION. Gary and I were very pleased to be interviewed for an article that appears in Design New England this month. The article is an overview of the Willard family of clockmakers and centers around the author's visit to the Willard House and Clock Museum, in Grafton, Massachusetts. While our most scholarly readers and clients may find it elemental, it is targeted toward the emerging collector. We view it as an important opportunity to reach these readers as they begin to explore antique collecting. A grandfather clock or banjo clock is often a first purchase for our new clients. The impact of a fine American clock, as a focal point in an entryway or living room, sets a theme around which to decorate. Follow this link to read the entire article by Bruce Irving. We have just returned from our annual trip to New York for antiques week. This year we had a booth at The Metro Show NYC, which is the show that replaced the TAAS show. The new show was terrific, with a great attendance and a much more attractive presentation. Our booth was larger than prior years and yet on opening night there was barely room to stand. Have a look at the images from that night. The show was reviewed by Scudder Smith at the Antiques and The Arts Weekly, click here to read more. As you may have seen in our blog, we bought a superb Newport demi-lune games table at CRN Auctions last month. It was made in Newport, RI., and has a wonderful cabriole front leg with carved ball & claw foot and carving on the knee. Well, the story has been picked up by Maine Antique Digest reporter David Hewett. Follow the link to read more. This is a fantastic story about an important piece of furniture that found it’s way to us. 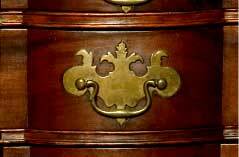 We purchased a high chest from a country auction house in Wyoming, that began it's life in Hingham, Massachusetts. The Main Antique Digest covered the story, follow the "Read More" link to learn the details, it is fascinating. It proves that great items are still available out there. Exceptional antique dwarf clock by Joshua Wilder acquired. 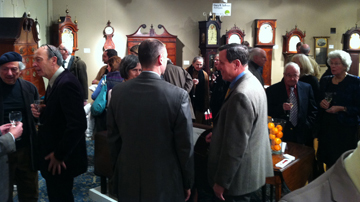 W e were thrilled to purchase an exceptional clock at the March 6th Americana sale at Skinner Auctions. 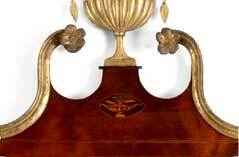 The circa 1822 dwarf clock, standing about four feet high is an exact miniature of a tall case (grandfather) clock. Early 19th century dwarf clocks from the Hingham/Hanover area, on the South Shore of Massachusetts, are highly prized by collectors. We purchased the clock for $189,600. on behalf of a private collector. Although not a record for a dwarf clock, this is one of the highest prices paid at public auction. Skinner's auction is reviewed at the Maine antique digest, click to read the article. Two of the reasons why it sold for so much more than what dwarf clocks typically bring are the combination of remarkable condition and superb form. Dwarf clocks were produced with various case styles and some command higher prices than others. Most dwarf clocks with a high degree of originality sell in the $10,000. To $50,000. Price range, but great examples can easily go higher. This model, with works made by Joshua Wilder (1786-1860), incorporates a case which is attributed to Weymouth Cabinetmaker Abiel White (1766-1844). It has French feet, quarter columns in the case, and a removable hood just like a full size clock. The cases with all of these features are the most highly sought after of all the dwarf clocks. 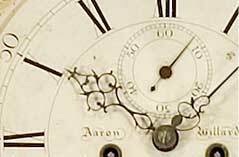 To learn more about Dwarf clocks be sure to read my article in Antiques & Fine Arts on the topic. Click here to down load a copy of that article. Here is the review of our booth at 2011 TAAS [The American Antique Show] We had another great year with strong sales, good turn our and a great selection of important objects. Sadly, this was the last year for this show. We intend to be present at a show in New York in 2012 during antiques week, which is always the third week in January. We will announce our plans so please look for postings here.